for February 24th are Glorious. What do I write today? Since that day, February 25th I have experienced the Bridegroom as He stands above me and strengthens me in this trial I have experienced. It has been a hellish experience to do the Father’s will, to stand firm for the truth when it would have been so much easier to laugh and to play as the world danced and I cried inside to stand behind the truth in this "Godless" world. February 23, 1994 5:30 a.m.
Jesus: I am the light of the world. A city on a hill will shine to the world. You at the Center will be this city when you are filled to the brim with the love of Jesus. What power, what might, to have each person a personal spouse of Jesus Christ! This is the light to the darkened world. The love of Jesus radiates from the very being of those who love Him. What light when all together are lifted by His love abounding deep within their breasts! I am the Way, the Truth and the Life. My life is the life inside that cannot be contained. It is bursting and budding forth. My life is the real life. To possess the life of Christ within your breast! Such power! I am the city set on a hill that will stand united and shine to this world. You at this Center will be this city. You will be the true Center that places the mark on this world. The love of Christ, abounding deep within the breasts of all, will be the power and the might. Pray the Prayer for Union with Jesus. I will operate in the hearts of all there and minister to My sick world. I am the Heart of Jesus. I am on fire with love of each and every soul. When My love is found in all the hearts there, the light of God will shine to this world! You are the city, set on a hill, that shines to the darkened world. I will light the world with the love of Jesus that shines in the hearts of those who are fed there. My light is so bright. My power is endless. You are the light to the dark world. You contain the mighty medicine to bring My sick ones to Me. You will bring so many back to Me and My intense love, burning so brightly for all! I am the power. I am the might. He who abides in Me will have the light of life. I give Myself to you that you will live. You will radiate My presence from your very being. My light is the brightest light. I will live in the hearts of all who come to you for their feeding. Enkindle in them the love for My most Sacred Heart. It is on fire for love of you. It cannot be contained. It will live in all hearts who come to you to be fed. You are the key to enkindle this burning love of Jesus in the hearts of so many. Many will know Jesus through your love of Me. Read these letters every day for I am truly speaking to you here. I love each child so dearly and want to have an intimate union with that child. Teach all about the burning love of Jesus. Read My messages with your heart on fire so you can tell all of My ardent love for them. I long to be close to them. I am a person. I am God, on fire for love of My people. Bring all to the ardent love of Jesus. Mary is by My side constantly. Where I am, she is there. She wants all to be led to My ardent, longing love. Teach all about My love. Fill them so they are overflowing in their hearts. This is the mighty medicine. It is My letter of intense, ardent love for My people. I am truly here, little ones. I am Jesus, Son of the Living God. I will live strongly in the hearts of all who come to you. You will be the key. Focus on your intense love of Me. Read My letters as a cookbook for intimacy with Me. My love waits for each person and I tell you here how to be close to Me. I am the Sacred Heart of Jesus on fire for love of you. I am longing for you to come and be with Me in silence. I will give you all you need. I am the Alpha. I am the Omega. I am your all. I am God, one, true and magnificent, and I come to you with ardent love in Holy Communion and in the tabernacle. I am present, Body and Blood, Soul and Divinity. I am waiting. Our love affair waits and it depends on you. I am there and I am waiting. You keep us apart. Tell them how I long for them and have all they need. The love of Christ will light their city. You will stand as the lighted city in darkness. My love will be that by which you light this dark world. Oh, such power, such might! The love of God will reign in the hearts of all you touch. You are My vessel to draw this world to the love of Jesus. Read and study My letters and be taught about My ardent love. I am Jesus Christ and I am teaching you about My love on fire for all. Come and be powered by the hand of God. My love will rock the world off its rocker when it reigns in the hearts of those who come to you. I love you so! You are My beloved. I will use you to light My dark world. You will shine as candles in the darkest night and you will be the instruments I use to light their wicks. I am God and I love them so dearly! Jesus: I want this emotion in the letter I told you to write. I, Jesus, Son of God, talk to you with such emotion! I am He Who died a brutal death for love of you. I died for you! I love you this much, to give My Life! Yet you couldn't even write when I asked you. You must do exactly as I say. I do not want you ever to say no to Me! I have such emotion! I am telling you how I died a brutal death and you, My child, did not write for Me! What more can I do? What more do they want? You put others before Me or you would do as I command. I want you to do as I tell you every moment. I am the Lord. I am the Son of God. Such emotion I let you feel for My death. I died. I am a person. I was human and I died for you. Think of yourself giving your life for someone and they do not care. What can I do to shake you? What more can I say? I am here and I am loving you and pleading with you to listen to Me with this emotion that God is telling you. I am Jesus. I died for you. I gave My life for you and do you even listen, My little sweet one? You didn't want to write it for My children. When I give you a command, you write. When I say do, you do. Selflessness! I am pushing you because I need your total surrender. Do not ever deny My writing to My loved ones. You have a responsibility. I don't care where you are when I talk. I am God and I talk to you. I am so present to you. Listen. I need your selflessness. I need your surrender. I need your life, given for love of Me and Me alone. I need you to be the light that shines on the hill, that does not go in and out but is constant in My love. I need your commitment. I need your attention at every moment. I am feeding you My words every moment on paper and in your hand. You must obey Me exactly as I command. No questions, only action. I want action. Now! You write when I say write. I don't care where you are. You worry not for others. I am giving you the mighty medicine. Would you tell the doctor to wait? I am God and I do not ever want to wait while you play a safe game with Me. When I say do something, I want you to do it. You are My beloved and I am filling you with fire. I am pushing you to do that which I need done. Do not ever stop to look around. Keep your focus on Me and My commands for you. I am using you every moment. I must be able to count on your constant consent to do My will immediately! I am calling you to this work and I want you to comply. I love you ardently. I am so full of love for you. Focus on this and this alone. I am Who am. I am God, child. Do not ever hesitate. Do not doubt or think. You must act as I act in you or My work will not be done. Be selfless about My commands. You will do My work. You will spread My words of love and create emotion with My songs and I will use you to bring My flock to My love. I love every soul! You must spread My love. Note: (Meditating on the Crucifixion) Going to Mass at the seminary at 8:00 a.m. was rushed. He said to me, "Where are you going, child. Do you not feel My presence with you?" A calm came over me. Then He started lamenting how He died for us, how He is a true person and He loves us so much. He said, "I died for you." R. He gave His life for us. He is the little lamb led to the slaughter out of love for us. He said, "I need you to do this work now and I am pushing you." He was so upset! He died for us. He loves us so much as to give His life. He begged me to spread His love, to tell others how He, bloodied, bruised and beaten, gave us His life. Jesus: I am God. I am God. I died. Spread My love now! Now! Now! Now! Now! I am begging you not to hold back! Read these letters now, read and learn about My love. I beckon you to speak of My love. Shout it from the high roof. Proclaim it in the cities. Jesus Christ died for love of you and He is risen! I am He Who is God and I died for you! Listen and preach My love and emotion here. Priests will create little cities, little cities in each church to spread the light of Christ to this sick world. Each priest can create his own little city, a powerhouse of God's love. God has all the power. His power is endless. It never runs out. It is might. You have no power except through Him. Churches filled with the intimate love of Jesus will be powerhouses. I am God, My little ones. God can do all things. I can make your cities light up the darkness. I am the Way, the Truth, the Life. I am the light of life. I am God! I can do all things. I want to act in you. You need to be in constant union with Me. My priests, you need to be selfless. My soul and yours are one. I want to act in you. Jesus: I ask My Shepherds of Christ apostles and as many as possible to pray in this way for this novena praying for the special coming of the Holy Spirit. Think of yourselves as My spouse dwelling in Our pure and holy Hearts united to the Holy Sacrifice of the Mass. I ask you to gather at 6:20 every evening. I ask you to recognize yourself as a body and realize others are praying with you at 6:20 p.m. I STRESS it is important for as many as possible to pray at 6:20 p.m. If you cannot pray at 6:20 p.m., I ask you to stop if possible and reflect as I will indicate later, but as many as possible are asked to pray. You are a body praying. You must feel this unity praying to your God as the people of My Movement, the Church and the world. You are gathered in one place, the world dwelling in the Hearts of Jesus and Mary. Begin the novena February 25, 1999, this will continue until I tell you to stop. 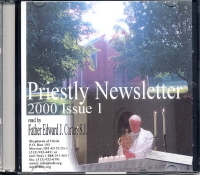 It will be important to notify as many as possible by phone of the beginning of this novena. If you have not been notified you must begin whenever you become aware of this novena. Jesus: The Florida Center will pray non-stop this way until I direct differently. I also ask the Morrow Center to pray uninterruptedly which means someone should be there every night. China will pray every day in China at 6:20 p.m. except on Sundays. 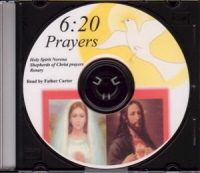 They are asked to pray at 6:20 p.m. if possible in the car. This day of holy prayer on Sunday by My handmaids of China will please Me very much. Think of being united with all others praying as a body, as were the Apostles at Pentecost. Pray for the special coming of the Holy Spirit. Think of yourself as My spouse dwelling in the pure Heart of Mary and in My Sacred Heart. Feel the deep union of your hearts in Me. Jesus: If it is impossible for some apostles to follow this schedule at certain times, I ask them to stop at 6:30 p.m., give their hearts to Jesus and Mary with everyone in love, ask for the special coming of the Holy Spirit and ask for grace for the priests, and the renewal of the Church and the world. If time permits, consecrate the Movement, the Church and the world to the Sacred Heart of Jesus and the Immaculate Heart of Mary and ask that the Blood of Jesus be spread on the Movement, the Church and the world. Say the Holy Spirit Novena during the day and include the intentions as indicated. Say the Shepherds of Christ Prayers and the appropriate mysteries of the rosary. On February 25, 1999, begin the Joyful Mysteries. On Thursday, China and Florida must listen to the appropriate mysteries. I wish them strictly to follow the Rosary Novena and all others to follow the appropriate mysteries on the appropriate day. Some have not followed the appropriate day as was indicated for the Rosary Novena so I ask that on February 25, 1999, you begin this schedule for the Rosary Novena. All must follow directly everyday. Rosaries on Sunday afternoons will be out of the scheduled order to accommodate Florida and China on Thursday nights. Therefore you must say the appropriate mysteries on Sunday at 6:20 p.m. if possible. Jesus: I ask that all apostles adhere fervently to this novena. This is for all intentions of the Shepherds of Christ including intentions given to Father Carter, John and the list I give to my messenger. I ask all apostles to fervently say the Holy Spirit Novena daily and the Shepherds of Christ Prayers. This message is for my apostles in the Shepherds of Christ and others wishing to follow it. It is important you stay united everyday in your Morning Offering and see yourselves as one body pleading for the Church and the world and the priests. Consecrate the hearts of all in the Movement, the Church and the world to the Sacred Heart and Immaculate Heart of Mary and pray that the Blood of Jesus will be spread on the Movement, Church and the world all through the day. Cast the devil into hell and pray to the angels, especially St. Michael and your guardian angels, to protect you. Guard this message, circulate it to the whole Movement by mail and by fax as soon as possible. Phone coordinators should call beginning today. This rosary was prayed before Jesus in the Tabernacle in the Holy Spirit Chapel. Rita, Don and Marty were present. Jesus appeared in great light during the rosary. He looked "red" and the light was flashing brightly. 1. R. The angel Gabriel appeared to Mary and asked her to be the Mother of Jesus. 2. R. Mary lived in the Father's Will. 4. R. God the Father so loved the world He sent His only Son into the world born of the Virgin Mary. R. Who are we that God sends His Son into this world and that His Son, Jesus Christ, takes on a human nature? Jesus is our Mediator with the Father. 6. R. There is such intimacy between Jesus and His Mother. Jesus wants us to go through His Mother to become ever closer to Him. 7. R. Jesus loves His Mother so much. He gave to John His very Mother. He gave Mary to us to be our Spiritual Mother. She is the Mother of the Church. He wants us to go through Mary to be joined ever closer to Him. 8. R. Mary leads us from our infancy as our Spiritual Mother — if we let her. On our spiritual journey God gives us a more profound knowledge and love of God and leads us in deeper union to Him. Mary is our Spiritual Mother. She nurtures us, cares for us and leads us to close union with the Father, Son and Holy Spirit with Mary His Mother? 9. R. Through the Holy Spirit, the child Jesus was born. 10. R. Jesus shows us how important the Virgin Mary is as a Mother to each one of us. Jesus chose a woman, Mary, as the means to come into this world. And Jesus crowns her as Queen of Heaven and Earth. This is Jesus' Mother! It is through her we are led to closest intimacy with His Most Sacred Heart. Mary is the Mediatrix of all graces. Jesus loves His Mother and He wants us to seek out and love His Mother. 1. R. See Mary as she travels to visit her cousin Elizabeth, the child Jesus within her womb. Jesus is God, in all His Majesty and Might, yet He comes to this earth within the womb of Mary. We do not see indication of Jesus' Majesty and Might as Mary carries the child Jesus in her womb. All we see is the Blessed Virgin. Jesus remains with us this day in the consecrated host. Jesus Christ, the Son of God, is truly present in the consecrated host. 2. R. Mary travels to her cousin Elizabeth's and when she arrives, the baby in Elizabeth's womb leaps for joy. John the Baptist, a voice crying in the desert, even before his birth proclaims such joy in the womb of his mother, Elizabeth. R. The servant usually goes to the Master. Jesus came to us in Mary's womb. Mary visited Elizabeth. 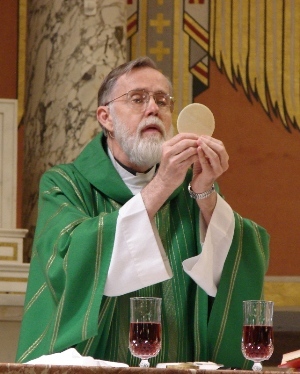 Jesus comes to us today in the Eucharist. Jesus is God yet He comes to mere humans out of great love. 4. R. Mary is filled with the Holy Spirit and cries out in a loud voice her Magnificat. 8. R. We are blind! We do not see! We see only what is visible and before our eyes. We want to learn with the use of our eyes and our ears. We must reach further and further and pray to the Spirit to fill us with knowledge in our hearts. Jesus dwells in the Tabernacle. Jesus was inside His Mother's womb. Mary carried the child Jesus, we do not see the majesty and the might of the Almighty God who is truly present, within our midst and in the Tabernacle. R. Mary is the Mother of God! Do we realize what this means? 10. R. Mary, conceived without sin and with a pure and tender Heart, is our model. It is in following after Mary and modeling our behavior after her that we will become more like Jesus, the Son of God! 1. R. God, with all His might and majesty chooses to come into this world in a little baby body. See a little baby! 2. R. God the Father so loved the world that He sent His only begotten Son into the world to be born. The Word was made flesh! Jesus Christ, a Divine Person with two natures: a human nature and a Divine nature, lived on this earth to show us the way. He was born from Mary's womb. He came, He humbled Himself. 3. R. Through His life, death and resurrection, Jesus has come to give us life, and to give us this life in abundance. Jesus loves us so much that He was born a baby in poverty in the town of Bethlehem. Jesus was born in a stable because there was not room for Him in the Inn. 4. R. The horn that beeps the loudest is not the mightiest! The person that is fixed in union with God has such might that he can move a mountain! God is mighty! He is all powerful! Yet Jesus was born in a little stable in the town of Bethlehem. Jesus was laid on bare wood. He comes without noise, without proclamation. But a star shines above Him, a star from the heavens, proclaiming that Jesus Christ is truly the Son of God! 5. R. Who are we that the Son of God remains with us this day in this room in the Eucharist, in His Divinity and humanity, no less present than the day He was born in a stable in Bethlehem. He is in this room at this very moment with the same love that He had that led Him to come, to give His life and to rise on the third day in order to give us new life. 7. R. Jesus came into this world a little baby so that we may have life eternal if we love and serve Him. R. Mary always did the Will of the Father! Jesus always did the will of the Father! It is in living in the Father's will that we will obtain happiness, joy and peace. If we try to follow our own will, opposed to God's will, we will not be at rest. 9. R. Surrender! Surrender! Surrender! All through the lives of Jesus and Mary, they surrendered to the will of the Father. Not just doing the Father's will, but as a child, living in the will of their Father! 10. R. It is through Jesus' birth that we are made brothers in Christ. God is our Father. We are one in Him! 1. R. The child Jesus is taken up to the Temple by Mary and Joseph. 2. R. The old prophet, Simeon, was told by the Spirit that he would not die until he had seen the Messiah. He was led to the Temple by the Spirit. 3. R. Simeon held the child Jesus and he prophesied the sufferings of Jesus and Mary to come. 4. R. From that moment on, whenever Mary looked at her beloved child, she remembered the prophecy of Simeon and her Heart was in such sorrow. 5. R. It is through the pierced Heart of Jesus that the sacramental life of the Church was born. 6. R. Before Jesus ascended into Heaven, He gave to the Apostles the power to baptize. It is in Baptism that we are made children of God and heirs of Heaven, that we share in His life in a special way. Jesus outpours His grace. We are given so many gifts in Baptism! 7. R. As Jesus was presented in the Temple, it reminds us that in our own Baptism that we are reborn into His life, this sharing in His life, through Baptism. 8. R. Our human natures are raised to such heights through the sacrament of Baptism. 9. R. Help us always to live out our commitment to God we made when we were baptized. 10. R. We are called through Baptism to go out and spread the Good News, the Gospel of Jesus Christ, to this world. 1. R. When Jesus was twelve years old He was taken up to the Temple for the feast of the Passover. 2. R. When the Passover was over, His parents left with the caravan and did not realize that they had left Jesus behind. 3. R. With their hearts filled with such sorrow, they returned to the Temple to search for the child Jesus. 4. R. Jesus told them that He was about His Father's business as He was teaching the doctors in the Temple. But then He went down and was subject to them. Are we about our Father's business? The Father has a unique and special plan for each one of us. 5. R. We are the Father's children. The relationship between us and the Father should be as His favored, precious children that He loves so much. 6. R. Jesus created us so special, so unique. For each one of us He has this unique plan. It is only in living in His will that we will have peace, love and joy. If we try to go against His will, we will not be happy. 7. R. The will of God is made known to us in the quiet of our hearts. When we are in communion with God, it is through the Spirit that He releases His gifts of Wisdom, Knowledge and Understanding to know more and more what the Father's plan is for each one of us. We can only know what God plans for us by listening and being obedient to Him. 8. R. And Jesus cried out from the Tabernacle to come to Him and abide ever so closely within His Most Sacred Heart. His Heart is beating and on fire. It is waiting and longing for our love. He wants each one of us to be in close union with Him. 9. R. Do we blush to be in love with someone? Jesus blushes for us here. He loves us so much. His Heart is burning with abundant love for each one of us. He bids us to come and be in closer union with His Most Sacred Heart.